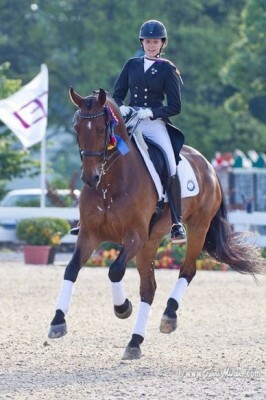 Congratulations to Ayden Uhlir and Sjapoer (by Contango) for winning the Individual Dressage Gold Medal at NAJYRC 2013!!! 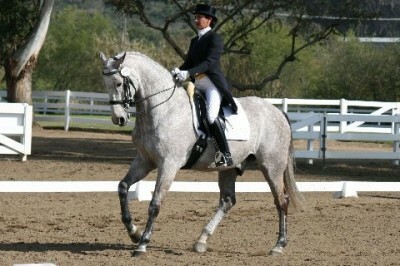 This pair also won the last year national individual dressage Junior Rider championship. I am glad that I was able to find you this horse. 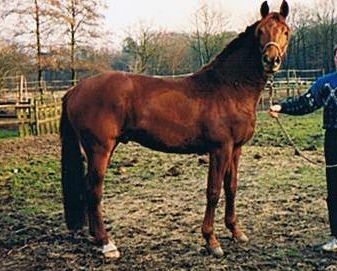 In the fall of 1997, I visited the stables of Adriaan van de Goor in Herpen (NL) to see some young horses. 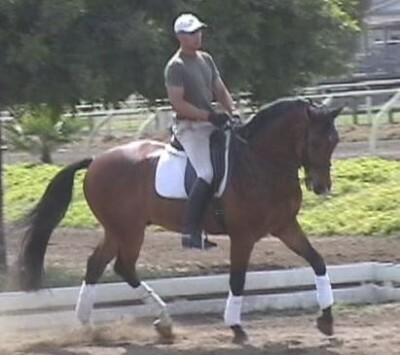 He showed me several nice horses, including a three year old dark bay gelding by Ferro. For his age and size this horse already was pretty developed. Since there was no rider present, I got on the horse without seeing it first go under saddle. As soon as I started trotting, I immediately felt his great rideability. After several minutes of riding, I was completely in love with it. After trying it only once, I decided to buy it right away. Now the purchase of Mythilus was a fact. 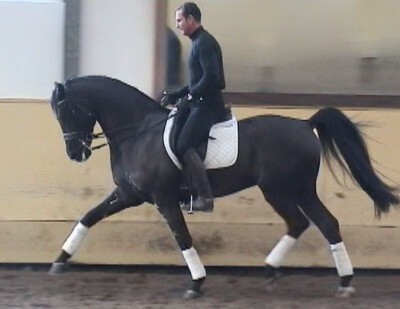 Initially I put Mythilus in training with Stefanie Steinhauf-Ueffing in Haldern (Germany). 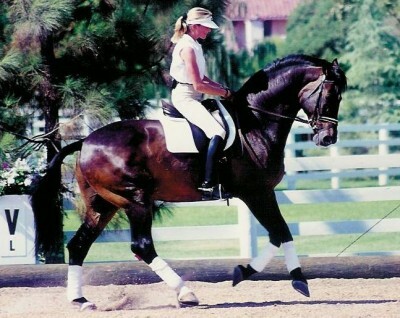 She is the one who taught him the basics of dressage. It always was a great pleasure to watch this combination training. Two years later Natascha and Hans Bernoski became partners in Mythilus. After the good foundation from Stefanie, the Bernoskis took over, and with a lot of success they trained Mythilus into a Grand Prix horse. Natascha only got to show him twice in Grand Prix (with great scores), and shortly after I sold Myth to one of Courtney King-Dye’s sponsors. With Courtney, Mythilus’ career progressed quickly. She first showed him in the Small Tour (to get used to him). In 2007 the pair started in their first Grand Prix and it is unbelievable how many classes they won in such a short time. 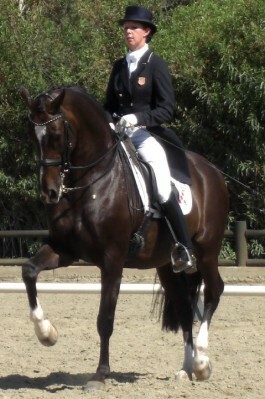 In June 2008, Courtney and Mythilus made it to the final selection trial for a spot on the US Olympic Team. During two weekends all 12 finalists had to ride four tests. In the beginning the judges did not really know how to score this relatively new combination. Therefore in each consecutive test Courtney and Myth were rewarded with an even higher score. (What a beautiful pair the two of them are!) They had four great performances and qualified to represent the United States at the 2008 Summer Olympic Games in Beijing (China). What a great success this was for Courtney and Mythilus. At the Olympics in Beijing they even topped this result by receiving the highest US team score in the Dressage Team (GP) Competition (Steffen Peters and Debbie McDonald were the other team members). This put Courtney and Myth into the 7th spot of the individual rankings. Two of the five judges placed Mythilus 3rd and 4th. Unfortunately it was the German judge that did the remarkable thing to place them 16th!! Still, overall this was a fantastic result. 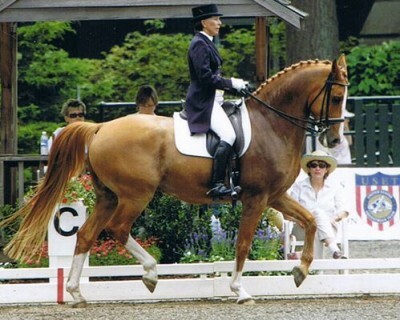 For me personally this also was a success, since after the 2000 Summer Olympic Games in Sydney, the best performing US team horse came once again from Gieling Dressage Horses. In Sydney it was Christine Traurig with Etienne who was able to do this. 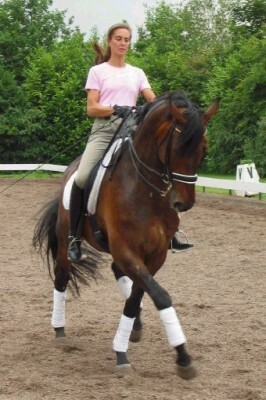 Several years ago, I saw this wonderful four year old stallion in a small dark barn in Holland. He was just broken and the first time I saw him move, he was without a rider, running around in the dark indoor. I asked the owner to tell me more about this horse. I liked him a lot and would love to see him go under saddle. At that time I was looking for good young horses for several clients of mine. I got to see him under saddle and loved him even more. 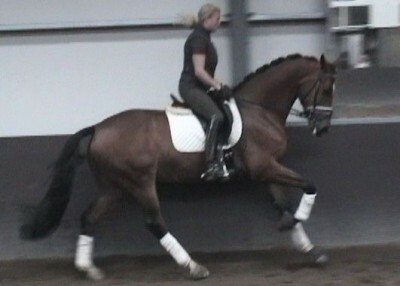 What a great talent this horse showed already at four years old and only just broken! 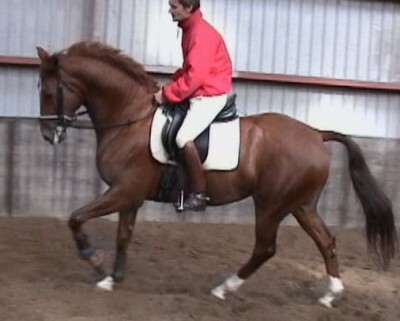 I video taped him and sent the video to a client in the USA who had bought a very good horse from me before. Now she was looking for another one. 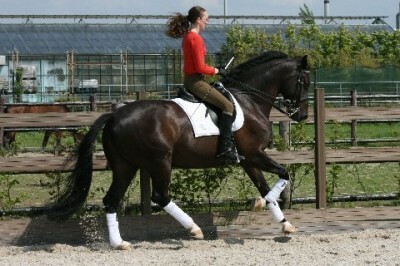 I also had told a good friend of mine in The Netherlands about this young stallion I had seen. In the past I had found good horses for my friend as well. He had told me that if I ever see another good young horse, I should call him. So I did. We went back and saw the stallion again. On the way back home, he didn't say much. He knew that I had sent a tape to my client in the USA and that I was waiting for an answer. Later, when I dropped him off at his house the only thing he said was, that if my client decides not to buy this four year old green stallion I should call him again, he might be interested. After a few days, my US client got back to me and told me that she liked it a lot, but had also seen a different horse that she preferred. Too bad I thought, since I had not seen such a good horse for a long time. So I called my Dutch friend again and told him about her decision. The only thing he said was; "OK, then I'll buy it"!!! WOW, I had not expected a decision from him so soon, but this was great news. We then went back to the barn one more time and purchased the stallion. Now, the problem was, he had this wonderful stallion that had passed the vet check with flying colors, but he had no rider for it. He first thought that this horse would be for his daughter, but decided against it a few days later. My friend then told me that there is this great young guy riding and training at their barn and he would like to have him train the stallion. The trainer's name was Edward Gal and, of course, the horse I am talking about is LINGH!!! 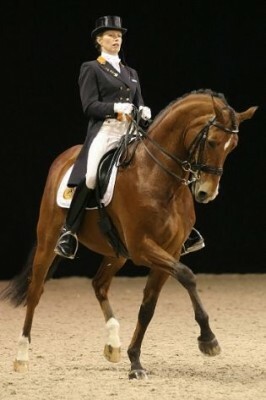 Several years later, when I was at the 2005 World Cup Dressage in Las Vegas watching Edward and Lingh in the opening Grand Prix (the first time he beat Anky with Salinero), this story went through my mind again, I had goose bumps during the whole ride and I could not talk for several moments!! What a great moment this was for me. Finding exceptional talent and seeing the resulting success has made my work very special and continues to be my driving force finding future champions. This is the beauty for me in working with horses!! 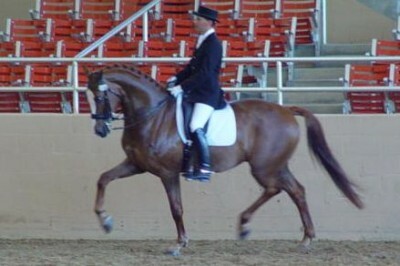 During the 2000 Sydney Olympic Games, Christine Traurig with Etienne, a 12-year-old Westphalian gelding owned by Mr. and Mrs. Robert Haas, was the final pair to start in the dressage competition that took place on two consecutive days. When she entered the arena, the U.S. was in 4th position!! To secure her team the bronze medal, Christine and Etienne needed a score higher than they had ever achieved before. She rode Etienne to his best score ever and gave (earned) the U.S. Equestrian Team (USET) its third consecutive Olympic team Bronze Medal. What a moment!! 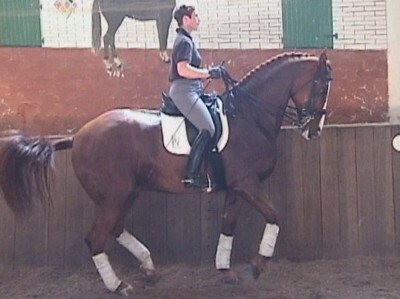 A fantastic horse that I found and purchased when it was 6 years old. 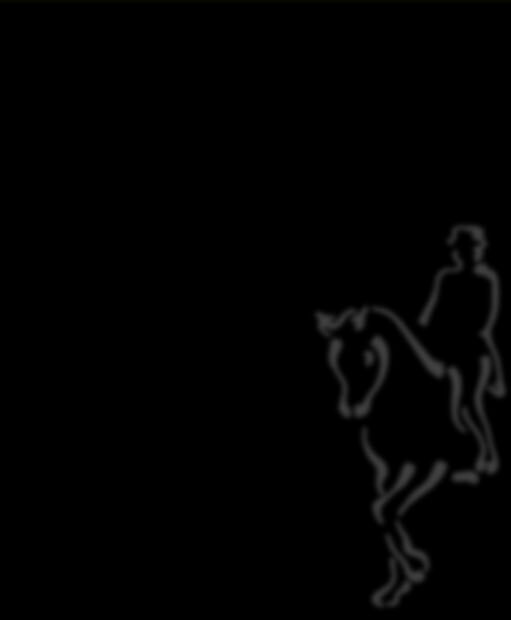 Today, I am still part owner of Nelson together with Anky van Grunsven and Sjef Janssen. 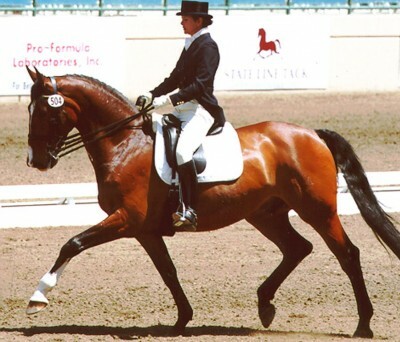 Jazzman has won several Grand Prix dressage classes and also winner of the Gold Medal with the US Team at the Pan-American Games. I purchased this gorgeous chestnut when he was only one year old. 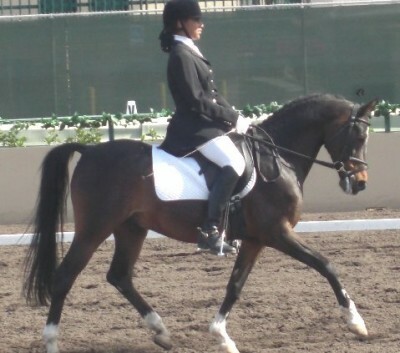 Donna purchased this horse when she was sitting at home with a broken leg. She saw him on the video and decided to buy him without trying him! Great eye Donna!! 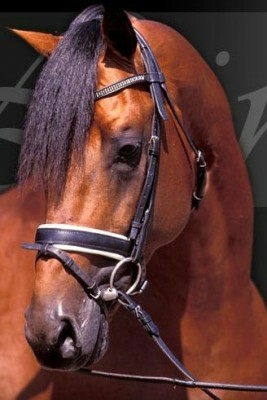 We purchased Largo when he was five years old. Most of his training was done by Stefanie Steinhauf-Ueffing. Later Natascha Bernoski took over and showed him in several Grand Prix classes with great results. Ranked #1 2008 USEF National Young Horse 6 year old division. 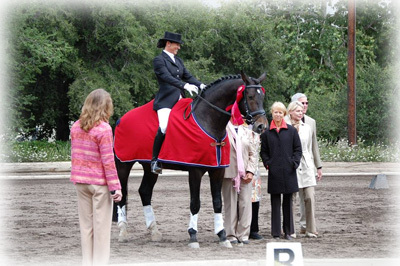 Winner of the 2008 Markel/USEF Six-Year-Old competition at the Cornerstone Event Management's Festival of the Horse CDI*** was Hit Parade SFS, a Rhinelander stallion by Show Star out of Esprina. 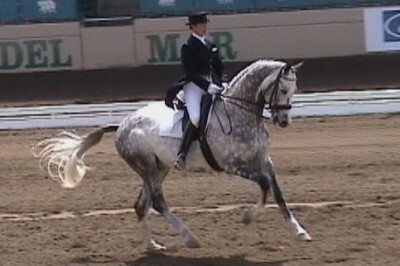 Hit Parade scored 8.48 with rider Sandra Burns-Gardner. Burns-Gardner co-owns the stallion with her sisters, Jeanne Burns and Kathy Schack. "We're a group," Burns-Gardner said. 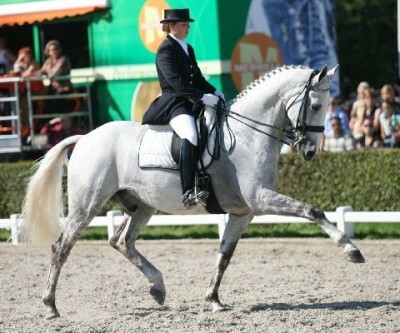 The sisters purchased the horse from a friend in Holland, Norbert Gieling. "He has a really good character and a fantastic work ethic. 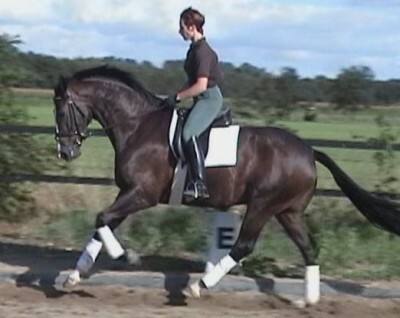 And, of course, he has beautiful gaits." Hit Parade was fourth overall in last year's national five year old competition. "He's just a pleasure to ride every day," said Burns-Gardner who works with Guenter Seidel. 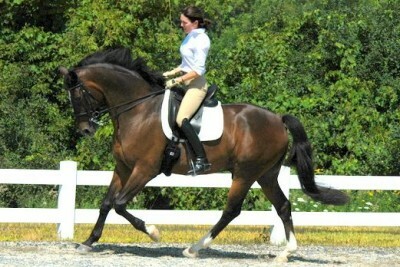 In 2008 Hit Parade is ranked #1 in the USEF National Young Horse six year old division. She said all Hit Parade needs is time to develop and grow stronger.